What is Trosyl used for? How do I use Trosyl? Trosyl nail fluid contains the active substance tioconazole, a drug belonging to the so-called antimyotics (fungicides). The active substance kills the fungi present in the nail. Because the solution is applied directly to the affected nail, the active substance can directly penetrate to the spot where it is needed. Trosyl nail fluid is prescribed for fungal nail infections, also called fungal nail or chalk nail. The symptoms of this condition are thickening and yellow discoloration of the nail (hence the name chalk nail), the nails become fragile/brittle and sometimes even fall out. A fungal nail infection often occurs in the feet and is often caused by a too humid environment. People who often go to the swimming pool or sauna are prone to it. Wearing synthetic socks and/or shoes also increases the infection risk. Make sure you wash your feet regularly (without soap) and that you wear cotton socks. Attention: Fungal nails are contagious! Never share your towel or nail scissors with someone else. Trosyl nail fluid must be applied directly to the affected nail. Trosyl must be used a long time: you can only stop treatment when the fungal nail has completely grown out and is replaced with a healthy nail. That takes six to twelve months on average. If you stop the treatment too early the fungal infection will return. Ensure you remove possible nail polish before starting treatment. As long as you use Trosyl you should not use nail polish on the affected nail. The active substance of Trosyl nail fluid otherwise cannot penetrate in the nail bed. 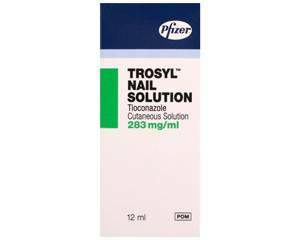 Trosyl nail fluid contains 28% tioconazole. Apply Trosyl nail fluid twice a day to the affected nail(s). Leave the fluid to dry before putting on your socks and/or shoes. Consult the leaflet for more information about the application of Trosyl nail fluid. Trosyl nail fluid rarely causes side effects. In very rare cases a hyper sensitivity reaction can occur in the shape of a skin rash. The leaflet will provide more information about possible counter indications, warnings and possible side effects. Trosyl may only be used during pregnancy or breastfeeding in consultation with the doctor.